The StitchLiner Mark III combines all processes from flat sheet collating, scoring, folding, and saddlestitching through three-knife trimming into a single system. The StitchLiner Mark III features an expanded booklet size range and increased productivity of up to 6,000 booklets per hour. Wide range of booklets: The system can produce a wide range of applications, including landscape-size booklets, 12” by 12” calendars, and pocket booklets down to 4.5” by 3.5”. 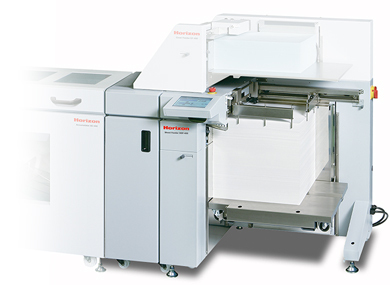 Full automation: The StitchLiner Mark III offers a fully automated setup, including stitching head settings and adjusting book thickness at the trimmer, to deliver higher quality booklets with greater efficiency – even for variable stitch length and variable page count booklets.